All the Brews Fit to Pint: The Week in Beer: As American As... Pumpkin Beer? The Week in Beer: As American As... Pumpkin Beer? 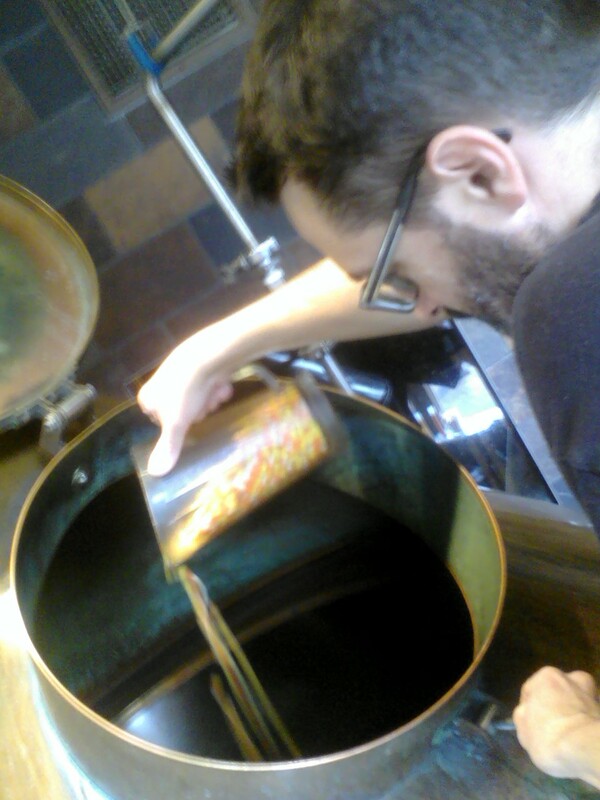 Brewer Duncan Williams adds the secret ingredient to Grizzly Peak's upcoming Biere d'Automne: candy corn. Photo courtesy Duncan Williams. I don’t know how or why the phrase “as American as apple pie” got started, but for my money, the truly American dessert pastry is pumpkin pie, which is at least actually native to these shores — and better tasting, as far as this patriot is concerned. (Apple pie recipes, my friend Wikipedia tells me, date way back to Chaucerian England.) What’s the deal here? Did the apple just have a better PR department than the poor old pumpkin? At least the ingenious craft brewers of this land have finally begun to realize the possibilities of our orange, pulpy friend with an ever-growing number of seasonal beers featuring this American harvest staple. This week and throughout October, look around the area for several local, delicious examples of pumpkin beer and, if you’re not some kind of commie terrorist, you’ll spread the word Paul Revere-style to other patriots. Maybe together we can even get that old saying corrected. » When the Wolverine State Brewing tap room at 2019 W. Stadium opens its door at 4 p.m., be ready to try out the limited-quantity Bourbon Barrel Aged Oktoberfest Lager, which has been soaking up those oaky, bourbony, vanilla-y flavors since mid-April. Get a taste before it’s all gone. » North Peak Brewing Co., located in Traverse City, has been on a roll lately with its iconic series of beers, the latest of which includes the seasonal Hooligan Hoppy Pumpkin Ale. Come see what all the fuss is about at the biweekly Michigan beer tasting at Whole Foods Cranbrook, 990 W. Eisenhower, where Jimmy and the Beer and Wine Bar team will be featuring North Peak brews from 5-7 p.m. As always, glasses on draft are $3, sample pours are $1, and bottles of any Michigan beers are varying prices, sans corkage fees. » The Michigan Wolverines are on the road for the first time this season, and Wolverine State Brewing is the place to be to get your college football, beer, and BBQ fix when Holiday's Restaurant puts out a pulled porked, chicken, and beef buffet at the tap room beginning at 4:30 p.m., in time to get you stuffed and pumped up for kickoff at 7 p.m. Let's. Go. Blue! » On the pro side of things, "Detroit Lions" and "4-0" are phrases I don't believe anyone has ever uttered in the same sentence in my entire lifetime, but somehow now this improbable mixture of words and numbers is now reality. As a result, the Wolverine tap room is hosting WTKA radio's Sam Webb for a live broadcast from 7-9 p.m. leading up to the first Lions appearance on Monday Night Football since... well, I don't remember. Enjoy prizes, giveaways, and various specials and then take in the game against the Chicago "Da" Bears on the tube while you take in some fresh brews at the bar. » North Peak Brewing is sponsoring a free Ann Arbor screening of the new movie The Way, starring Martin Sheen and Emilio Estevez, who will be both be on hand at the Michigan Theatre to answer questions about the film following the screening. Beforehand, attendees can enjoy a bottle of North Peak's Wanderer IPA, a "session" (low alcohol) strength brew that nevertheless packs a nice, hoppy wallop for those who like it bitter. Register for the show here -- tickets are limited to the first 300. » Are you ready for fall? Beer can help. Check out the Oktoberfest tasting at Arbor Brewing, 114 E. Washington, with more than two dozen Maerzen and Vienna style lagers as well as an assortment of fall specialty beers on offer plus an appetizer buffet and door prizes, to boot. Tickets are $30, and tastings run from 7-9 p.m. Call 734-213-1393 or buy at the door, if available. On tap now at Liberty Street Brewing, 140 W. Liberty, Plymouth, the delicious Punkin Pie Ale has returned for the season. I’ll refrain from the cliché of saying it’s “like fall in a glass,” but if you’re jonesing for a good pumpkin-based beer, you may want to check this one out. Also on, though in much more limited quantities: Liberty’s Oktoberfest and Barber's Garden IPA, brewed with hops grown, yes, in the garden of the barber shop next door — try them before they're gone! Jolly Pumpkin Café & Brewery is now pouring its actual pumpkin beer, La Parcela No. 1 Pumpkin Ale, at the café in Ann Arbor, and bottles should be hitting store shelves this week as well. Coming in another week or so at Grizzly Peak is the Biere d’Automne, a Belgian style spiced ale brewed with — get this — candy corn. This brew will also serve as the base for the forthcoming cask conditioned Klevenkop Pumpkin Ale. Trick or treat! Not to be left out, Wolverine this month will offer Cucurbita Smiles, a brew made with pureed pumpkin and brown sugar and dry “hopped” with rum-soaked vanilla beans. Look for it closer to Halloween. Planning on heading to the October 22 Michigan Brewers Guild Detroit Fall Beer Festival? Get on the bus — the beer bus chartered by Arbor Brewing and Corner Brewery to take local imbibers to and from the festival at Detroit's Eastern Market. But act now: If enough tickets aren't sold this week, the bus will have to be canceled. Tix are $30; call the brewpub at 734-213-1393 or Corner at 734-480-2739 to reserve yours. Bus departs from Arbor at 10:45 a.m. and picks up Corner folks in Ypsilanti at 11.